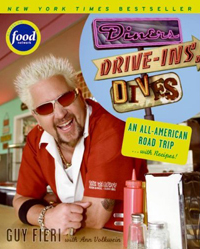 First, let’s start with the full title of the book because I think it is telling: Diners, Drive-ins, and Dives: An All-American Road Trip… With Recipes. The recipes in this book are sort of secondary to the places and people that Guy visits. The book runs about 250 pages and it only has 68 recipes in it. That is a pretty low ratio of recipes for a cookbook so let’s dive in see how he, and his fellow writer Ann Volkwein, fill those pages. Guy Fieri is an interesting dude. I really like his style and love watching Diners, Drive-ins, and Dives especially if I can find a marathon. On the show he is always on the look out for crazy places and the writing and stories in this book are profiles of some of the best. I think he really enjoys finding places in America that offer interesting and delicious takes on food. In this book there are 60 restaurants that Guy and his crew visit. All of these are places he has visited on the show, so if you watch it they will be very familiar to you. He gives obvious information about the location of each place but goes into a fair amount of detail about the history and favorite recipes. If you are keeping track, there is about one recipe per restaurant and a few have two. There are a few cool, yet very basic, things that this book does well. One thing I was shocked to see was an entire listing of every restaurant they have visited on Diners, Drive-in, and Dives. That’s 122 awesome diner locations. If I ever do a cross-country road trip, I might plan my route to hit as many of these places as possible. In addition, the entire book is organized by region, so it’s pretty easy to find places near you. Unfortunately, this is what I experienced in this book. If you only have 68 recipes in a 250 page book, I’m hoping that they are pretty fantastic recipes. More importantly, if you are introducing me to an awesome burger joint, I would like an awesome burger recipe. In my mind this book fails in this regard. – J.T. Farnham’s. Guy visits the place known for whole-belly fried clams and awesome seafood in general. But then he doesn’t provide a seafood recipe. Instead, I get a coleslaw recipe. Looks like a pretty decent coleslaw recipe, but I was disappointed when I turned the page. – Pizza Palace. Guy talks for two whole pages about the pizza at this place. The crust, the fresh ingredients, and a sauce that takes all day to simmer. When I turn the page I find a recipe for… Coconut cream pie? Kind of a let down dude. – Joe’s Gizzard City. Ok. Maybe this isn’t what everybody would want for this chapter, but if you tell me that a place has awesome, unbelievable even, fried gizzards, I want to know all about that. How do you cook them? How do you find them? When I turn the page I find a burger recipe. It’s a unique burger recipe (A burger that has been battered and deep fried), but I want to know more about gizzards! I noticed while I was reading that there was practically zero pictures of food. Not that a cookbook has to have photos, but if you are going to have photos, it is my belief that they should be photos of the food. If you’ve ever read my recipes on this site you can probably guess that is my philosophy. Photos of food: 15 (This is being very liberal. There are only a few that are of recipes presented in the book). Photos of Guy: 47 (Not including the full color cover shot). What is even more frustrating is that all of the photos are from shoots that they did. I’ve seen the shows. They had very expensive cameras there while these recipes were being made. So why can’t they print a nice photo of some of the recipes so I know what I’m making here?! I don’t really get it. If you travel frequently and like to stop off at diners (I know I do) then there may be some value in this book for you. Also, if you would like to know more about the history of some of the oldest and best diners in the country, then there is value in this book. But for the aspiring cook who is purchasing this book for recipes, you are going to be disappointed. As the title suggests, recipes are not the primary focus. Thanks for the facts about this book which I was intending to buy. I watch this show and some of the places look like they have terrific food and I too thought boy I'd love to have those recipes. I guess he couldn't put other people's recipes into a book.